Dear Santa Claus, please may I have a GPS for Christmas then I won’t have to do four U-turns in one day ! Or should I write to the Department of Roads and Bridges in Paris and ask for road signs to be sited before roundabouts and not two hundred yards down the road to the motorway! 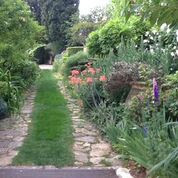 Yes, we were out and about on a garden visit in France ! 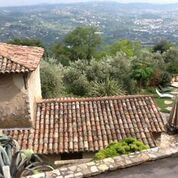 In the morning we made a return visit to Villa Fort France (“Fort” being an abbreviation of Fortescue, and “France” the shortened version of Francoise – two previous owners) not far from Grasse. 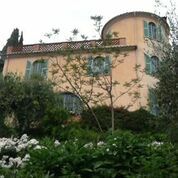 Sir John and Lady Fortescue bought the house in 1931, made alterations, adding the tower, and Lady Fortescue wrote her seven books at the house – the first of which was an earlier version of Peter Mayle’s description of the provençal way of life. 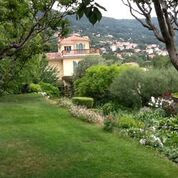 The garden (5,600 sq.m. 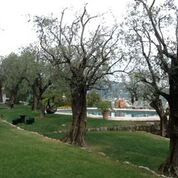 but seemed at least twice the size) was already sculpted in agricultural terraces with olive trees and vines and it was Lady Fortescue who created the rose garden on the same level as the house. 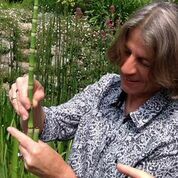 Another previous owner was a pharmacist and it was she who planted the rare botanical species but since 1992 the de Courcels have hugely extended the planting and added a watering system. [The risers for the sprayers are cleverly concealed vertically in old terracotta drainpipes found in architectural salvage yards]. 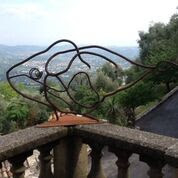 The garden is a blend of Provence and an English garden: Provence is represented in the narrow restanques rising from the road up to the house with their skeleton of olive trees, cypress and palm trees. The English influence comes from the roses climbing up the stone restanque walls and the romantic underplanting either side of the central paths in dense mixture of shrubs and perennials interspersed with white Iceberg roses. 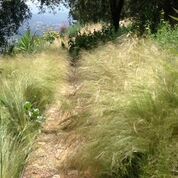 The ancient olive trees are heavily pruned every two years to let in light to the luscious floral ground cover planting. 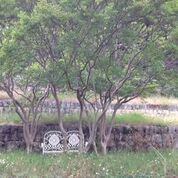 Most of the plants have been grown from seed and then allowed to self-seed; all the box hedging has been grown from cuttings. 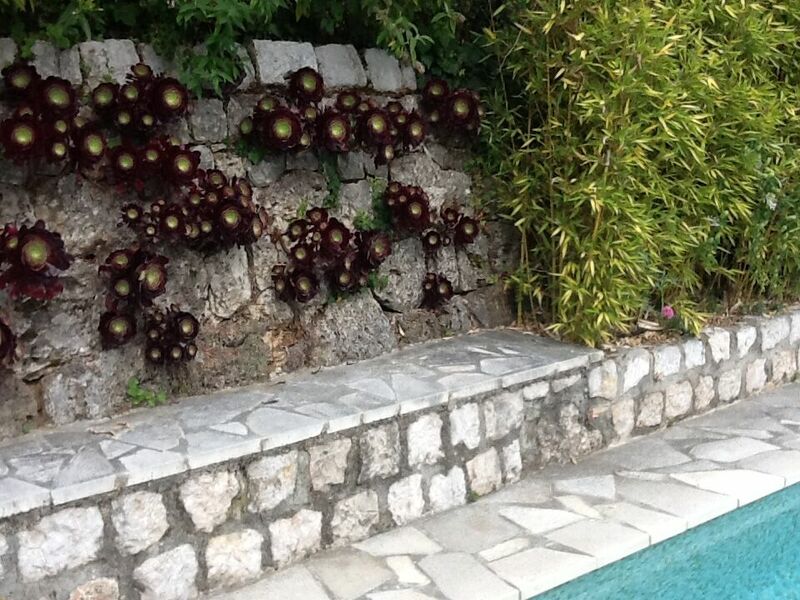 growing out of gaps between the stone (break off a stalk, allow to dry for eight days before inserting into the wall – no earth, no watering). We were just in time to see the sweet peas in flower over a long wall – lovely dark red and purple petals which are less insipid than the soft blues and pinks (and a very fashionable colour at the Chelsea Flower Show this year) in the powerful Mediterranean light. 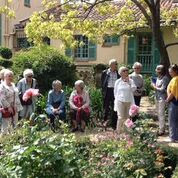 In the afternoon we visited Lady Lockett’s La Mouissone further up the hill from Villa Fort France. This is on a much larger scale not only in terms of land (3 hectares with 250 productive olive trees) but in terms of workforce. Two full-time gardeners are supplemented by interns with horticultural theory under their belt and seeking the experience of working in a challenging atmosphere. 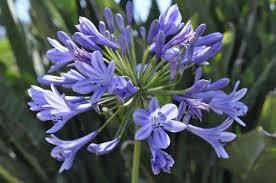 Interns are given the opportunity to devise plantings for new areas and talk through their ideas with Lady Lockett who is an unusual mix of plantswoman and landscape designer - a recent resiting of blue Agapanthus resulted in two or three dense plantings on sloping ledges close to a rock cliff. 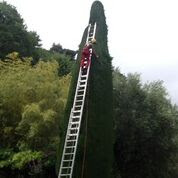 We struck lucky and were able to watch the head gardener giving a hugely tall cypress its annual haircut. He was attached to a high point of the trunk with the usual harness and balanced on an aluminium ladder, stepping off with one foot to work in wide upward sweeps with an electric chainsaw (lighter than the petrol version). He estimated it took him a day to trim each tree – there are four on the property. Outside the house front door was an interesting example of the “alternative” box hedging parterre in rosemary. The rosemary was not planted in a straight line but with alternate plants slightly forward; it is then trimmed with hand shears to form a vertical scalloped edging.with a flat top. The rosemary was planted two years ago and quite close together so it will be interesting to see if the scalloping can be controlled given the exhuberant form of rosemary. Again, the garden was entirely on restanques (the cost of repairing and rebuilding estimated in hundreds of thousands of euros) with a watering system in place so that new plantings could be watered the first year. The heavy duty pipework was concealed in narrow rills where it needed to traverse paving – almost invisible but still accessible. 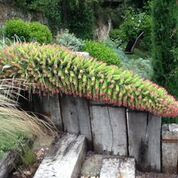 The planting was more stylised with groupings of huge architectural phormiums, skyscraper Echiums and bamboos. A wonderful raised fire-pit for barbeques was in the centre of a small courtyard with a spectacular view to the sea viewed from a dining area – the down side was the long trek to the kitchen if you had forgotten something mid- meal.